The Montreal Expos franchise, which moved to Washington, D.C., to become the Nationals in 2005, wasted no time in exiting the no no-no club. In the team’s ninth game on April 17, 1969, reliever-turned-starter Bill Stoneman struck out eight and walked five but gave up no-hits during the Expos’ 8-0 win over the Philadelphia Phillies. Stoneman would get one more no-no in 1972 and Expos pitchers would throw two more before the move to D.C. Jordan Zimmermann threw the Nationals’ first no-no in 2014, and Max Scherzer has since added two. In his 10th Major League start, Kansas City Royals starter Steve Busby walked five but no-hit the Detroit Tigers for a 3-0 victory on April 27, 1973, in the Royals’ 660th regular-season game. Busby would throw another no-hitter on June 19, 1974, becoming the first pitcher to ever throw two no-nos in his first two full seasons (he had thrown a couple late-season games in 1972). Other Royals pitchers would throw two more no-hitters to give the franchise a total of four. 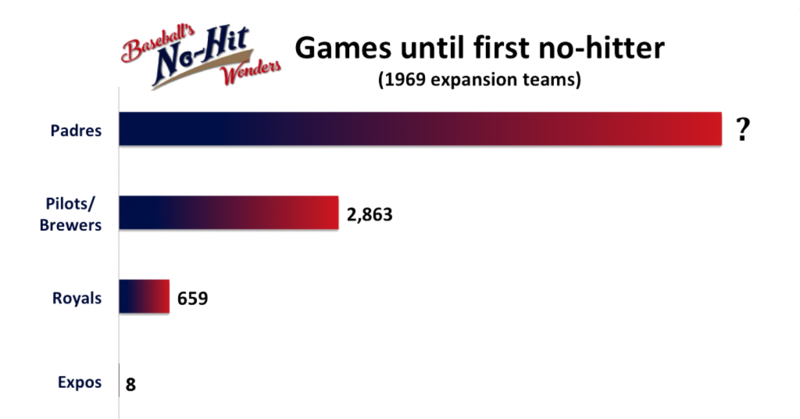 The Pilots lasted just one season in Seattle, and the team couldn’t notch a no-hitter or even a one-hitter during those 163 games (they did get three two-hitters). After the squad moved to Milwaukee and was renamed the Brewers, the franchise would have to wait 17 years for its first no-hitter. Juan Nieves became the first Puerto Rico native to throw a no-no on April 15, 1987, in the franchise’s 2,864th regular-season game, as the Brewers topped the Baltimore Orioles 7-0. Robin Yount made a game-ending diving catch to preserve Nieves’ gem, which remains the Brewers’ only no-no.